What makes us the BEST Colorado Goose Outfitters in the state. Many of our clients ask, “why do you put so much TLC into your blinds? 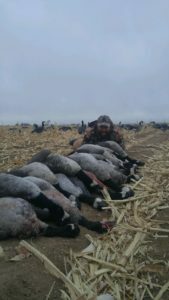 This is hunting!” Quite simply put, Colorado’s Front Range has quite a few goose hunting outfitters for you to choose from and we want to be sure you have an experience to remember. lakebed with nothing to block the wind. Shooting was good but the fact that all of our clothes were completely soaked put a serious damper on the “fun” factor. At about 9:15, I decided to head for the truck and crank up the heater. My hands were cramped up from the cold and rainwater had begun to pour down my waders. This remains the coldest day of hunting I’ve ever endured! If I had been hunting with an goose hunting outfitter, my feedback would have been, “Keep clients dry and provide heaters”. Whenbooking a hunt with us, you’ll find that our early season duck blinds are comfortable with places for everyone to sit. Occasionally, we’ll hit a fresh cut corn field before we’ve had time to get a pit in, at which time we’ll hunt layouts. When hunting fields during goose season, you’ll find that all of our pits have wood liners and heaters come standard. If hunting the ice, you’ll be in extremely comfortable blinds on the waters edge that you can easily stand up in. These blinds are very well concealed. We do everything we can to provide an amazing hunting experience while keeping our clients comfort at the forefront. Hope to see you in a blind!